¡®Despite the plethora of classic car books and magazines that are available to serious collectors and casual enthusiasts alike, none has established itself as a lasting global authority on the appearance, technical specifications, performance data and realistic market valuation of classic vehicles. The aim of Cloud Nine is nothing less. Every year, starting with this 2006/7 edition, Cloud Nine will publish its lavishly illustrated Classic Car Yearbook full of articles and reprints, as well as up-to-the-minute data on an ever widening range of famous, as well as lesser known, marques. The wealth of detail they contain is culled from a vast, and constantly growing database being built in close co-operation with enthusiasts, clubs and museums around the world. These Yearbooks, in conjunction with Cloud Nine¡¯s website and meeting places will fill the gap in the market, providing, at one and the same time, fascinating reading and a serious reference for owners, would-be owners, dealers and professionals. Where do we go from here? An online version of the CLOUD NINE Classics Yearbook 2006/7 will be available SOON. For a small subscription fee you will gain access to the most comprehensive, wide- ranging database of classic car valuations in the world. 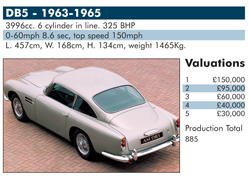 We will be constantly evaluating the classic car market and updating our valuations on a regular basis. You will also be able to monitor the site for new vehicles as soon as we add them. Just like the restoration of our 1960 Jaguar MK IX barn find we are lovingly putting together this website and want to make sure that every detail is precise. If you would like us to inform you of when these are raring to go simply leave your contact details and we will get in touch with you so you don¡¯t have to keep coming back.